This workshop will focus on a variety of ways that the analysis of molecular data is being applied to solve biological problems in medicine, agriculture, conservation and evolution. The presentations and problem solving sessions will focus on the relationships between evolutionary theory and the analysis of sequence and structure data. We are committed to integrating bioinformatics across the undergraduate biology curriculum in a way that emphasizes the inquiry driven approach captured in BioQUEST's three P's (problem-posing, problem-solving, and peer-persuasion). The workshop will be led by John Jungck, Sam Donovan and Teresa Johnson from Beloit College with invited presentations by Aviv Bergman from the Center for Computational Genetics and Biological Modeling at Stanford and Stephen Everse from the Department of Biochemistry at the University of Vermont. Please submit an application and plan to join us in October. We are still accepting applications on a first come, first served basis for a few remaining spots in the workshop. There are no registration or materials costs for participants based on NSF funding for this workshop. Some meals during the workshop will be provided (please see the tentative schedule for details). 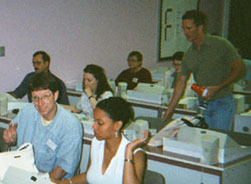 Participants are responsible for their own travel and lodging. There are limited resources available to defray participant travel and lodging costs-please inquire if financial assistance is needed for you to participate. Sponsored by a grant from the National Science Foundation (DUE/CCLI-ND), the BioQUEST Curriculum Consortium, and assisted by CloudShield Technologies, Inc.